WASHINGTON (Reuters) - Democrats in the U.S. Senate blocked the Keystone XL pipeline bill from moving forward on Monday, but supporters of the project vowed to push ahead and eventually get a vote on the measure. The Senate failed to get the 60 votes needed to limit debate, voting 53 to 39 on the measure. The Keystone bill allows Congress to approve TransCanada Corp's project to link Canada's oil sands to refineries on the Gulf Coast. Democrats, who lost control of the Senate as a result of November's elections, flexed their muscles to deliver a message to Majority Leader Mitch McConnell that he will have to deal with them even on bills that enjoy some bipartisan support. McConnell has pledged that amendments to bills will be debated in an open process. But Democrats said McConnell cut off debate last Thursday on several amendments. "He’s got to work with us and not try to jam us," Senator Chuck Schumer said of McConnell. Democrats are not trying to delay the bill, but they don't want McConnell to shut down the open process at his whim, said Schumer, the Senate's third ranking Democrat. 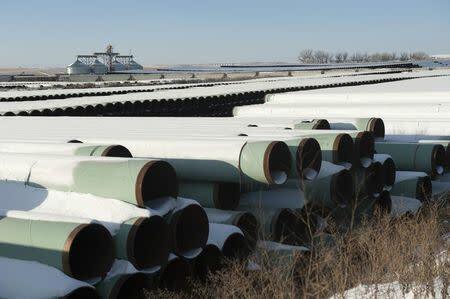 Republicans have made passing the Keystone bill the first priority of the new Senate. But the White House has said President Barack Obama would reject the bill, and Keystone supporters are four votes short of the 67 needed to overcome any veto. Senator Lisa Murkowski, the chairman of the energy committee, vowed to work with Democrats on her panel to consider additional amendments.